Maybe you are already familiar with the WS2812B RGB LEDs, also known as ‘NeoPixels’. 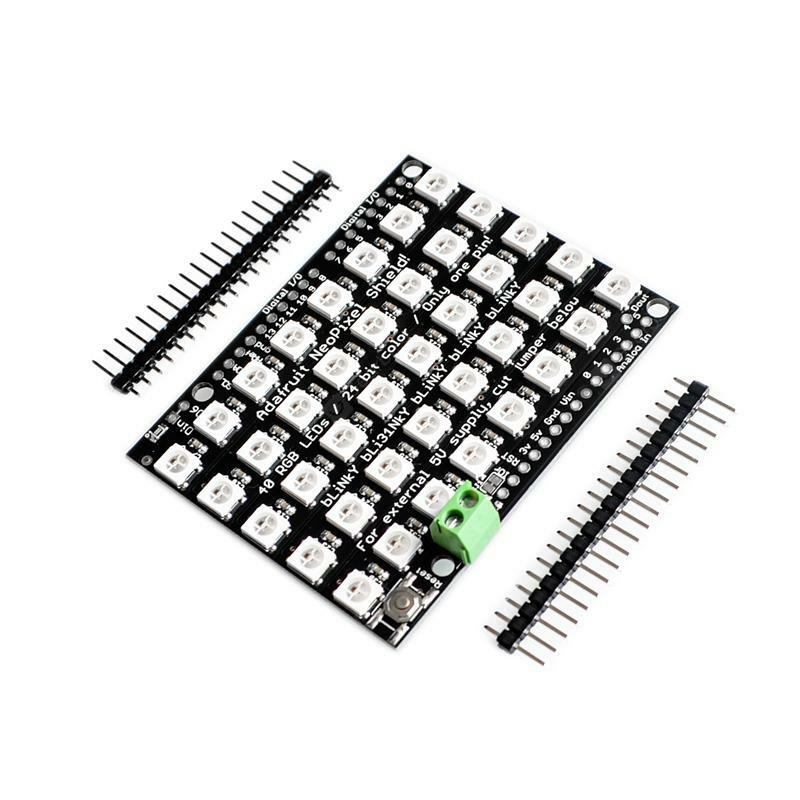 There are shields available for Arduino which have 40 of those individually addressable LEDs in a 5×8 matrix. Shields like the CJMCU 40 Bit 5 x 8 WS2812B 5050 RGB LED Driver Development Board are readily available from suppliers like VNG Systems. It’s easy to control the Arduino Neopixel shields from a sketch. You can also use Solderlab’s Glediator software to make your own light show. Glediator (short for ‘Graphical LED Installation AnimaTOR‘) is software to control led matrix and led stripe installations. This led matrix control application is written in Java and thus platform independent. You can run it on both Linux and Windows. Make sure you power the shield with an external 4-6VDC power supply wired to the shield’s terminal block. See the instructions that came with the Arduino NeoPixel shield on how to do that. Attach the shield to your Arduino and hook the Arduino up to your computer. Load the sample sketch to see if your Neopixel shield is working. When you upload the sketch to your Arduino, all of the 40 LEDs on the NeoPixel shield should light up green. If you want to control your Arduino NeoPixel shield with the Glediator software, you will first need to put the Glediator ‘client’ sketch on your Arduino. It’s a small sketch to receive data from Glediator and push it to the WS2812B pixels. Go to the Glediator downloads page and download the current version. Then open a terminal window. Go to the RXTX download page and download the latest stable release (binary) from the ‘Pre-Built Binaries’ section (I downloaded the file rxtx-2.1-7-bins-r2.zip). Navigate to the dist folder. Double click the .jar file Glediator_V2.jar. Then click Serial Open and your Arduino NeoPixel shield should come alive! I would like to use 10 strips of Led with 30 Leds each, ie a 10×30 Matrix to make a scrolling text; It’s possible? Connect all the strips together in a zig zag (snake) like pattern (so they alternate between going left and right). Use a 5V power source that is able to provide sufficient current, for instance an old computer power suppy. Do not power it from your Arduino directly, it will destroy your board. Connect the data pin of the LED strip to pin 6 of your Arduino (note that the data works in one direction only, see the arrows on your strip). Connect the ground of your power supply to both your Arduino and the strip so that everything shares the same ground connection. Connect the 5V to your strip last. It is best to feed the power to your strip not just from one end of the strip, it’s better to feed it between the two center strips or both ends, or even multiple points. If the power isn’t ‘spread’ evenly over the strip, the LEDs furthest from a power connection will not work correctly (incorrect colors, usually). In glediator you should set the correct X and Y sizes. Mapping mode should be ‘single pixels’ and pixel order probably one of the settings starting with “HS_” like “HS_TR” or “HS_BL”. on my java console and nothing happens. 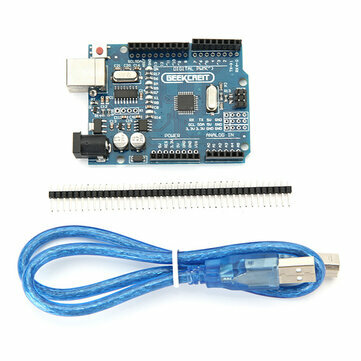 Do you have any idea what I can do to use glediator with my arduino and the shield? Tnx for the write up, I have managed to connect one 8×8, 2812 matrix, to my UNO, and controlling it from the Glediator. I only manage to turn on/ off the matrix, no matter what changes i do in glediator, te matrix dont change pattern. So Im quite stucked for the moment. Has to be said, its the 1st time im using Uno and glediator though…. Error Options: Wrong number_of_boards size. Excellent tutorial, I’m trying to build a system like this at home, but I’m not able to download Glediator. When I click on the download links I am informed that the page is not working. Would you let me know if there is another way to download. I found version 2.0.3 of Glediator in my personal archive. I do not not what the latest version is (probably the 2.0.3 one). I have temporarily put Glediator and the Arduino sketch in the downloads section, until the Solderlab website comes back online. Hi guys, you have done a great job that many people enjoy. I have installed the Glediator_V2.jar on a Windows 8, but I can not select any COM-Port. The drop-down list is empty. Also, I want to build the matrix 30×16 from WS2812B strips. From your experience should I use the black_PCB or white_PCB strips? Also, are you sure the 3pin WS2812B strip is fast enough to handle the frame rate? I have read, that the 4pin WS2801 strips (with the extra clock signal wire) are faster (and more expensive). Hi Tony, I do not own Windows 8 so I am able to help you with that question. About the white or black LED strips: I only have white PCB strips, I guess it just depends on taste and where you want to stick them on. I also have no experience with the 4pin WS2801 strips, they are still on my wish list. When I could not use Glediator on Windows, I bent my old hed and tried to install Glediator on Raspberry Pi3 according to your Linux instructions. I know, you Linux guys are pretty confident, that every human has deep Linux experience. But unfortunately, I don’t. Hi Tony, I do not have experience running Glediator on a Raspberry Pi, but did you install the full Raspbian with desktop or the lite version without the desktop? Exception in thread “main” java.awt.AWTError: Can’t connect to X11 window server using ‘:0.0’ as the value of the DISPLAY variable. thank you for your answer and yes, I am really happy that some Linux guy tries to help me instead of telling me RTFM ! I have the full Raspbian with desktop. And as you see here above, I managed to start the Glediator. But now I have problem to see the serial output port. It showes a couple of export commands, that have to be typed in and there should be a file, where one can edit these lines instead of typing them on each reboot. But the file mentioned “bashrc” in the video does not exist in my /etc/ folder. but it seems that these lines do not take effect. I have to type them manually.